The vendors comprise small, medium and large growers from around the state. With that variety, you get to experience the blend of exotic and tropical plants that are available to those of us here in zone 9. The mood of the folks there was very calm. People were just strolling along, with no one rushing, no hurrying around trying to get the “best deal”. Lots of conversations were to be heard. If you stopped and listened, you could hear customers and vendors talking up a storm about their favorite plants, what worked for them, what could spell disaster. A few good tips were picked along the way. Parched, we just had to sample the Italian ice…and……..yes, it was tasty. (We forgot and missed out on the hot dogs.) I got a new USFBG t-shirt. And our visit would not have been complete without checking out the garden’s bonsai collection and the bamboos. I walked in to the festival thinking that I might find one or 2 keepers. Trish was thinking the same. (We think that every year.) At the end of the day, we needed to get the golf cart shuttle guy to load up all the plants and haul it to our truck. We bought a lot beautiful new additions for our own little “botanical garden” at home. 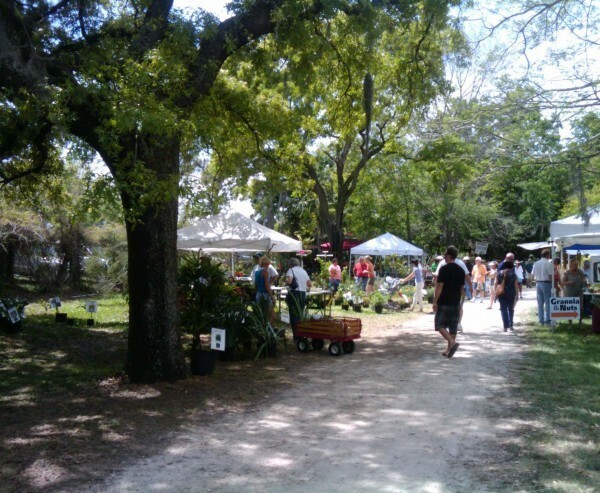 The USF Botanical Gardens is one of many fantastic natural resource for this area. If you want to spend a day enjoying the company of like-minded, plant-loving individuals, then I recommend that you make a point to attend one of these plant festivals. Check their schedule because they have other events throughout the year. Each plant sale has a different theme. Also, if you just want to spend a few hours with even more opportunity to relax and take in the beauty that fills this place, visit on one of the non-festival days.